Employment track record and income proofs Banks do not check your job stability or business stability to sanction you a gold loan. Gold loans are granted without income proofs. You only need to submit your basic KYC documents such as address proof, identity proof and Aadhaar card to avail this loan. Gold Loan calculator calculates the gold loan per gram based on the total weight of jewelry, level of purity, past 30 days average price of 22 carat gold and loan to value offered by your bank.As per today’s gold prices the highest gold loan per gram against 22 carat gold is Rs. 3,220 per gram.Key variables that are required to calculate gold loan rate per gram is past. 30 days average price of 22 carat gold which has to be adjusted down for level of purity before multiplying it with the LTV. In the table below, as on 22nd Apr 2019, the past 30 days average price of 22 carat gold is Rs. 30,515. However, you will be eligible for a lesser gold loan per gram of jewelry if you take a loan against 10 gram of 18 carat gold. If you take a loan against 18 carat gold, you will be eligible for a gold loan of Rs. 1,873 per gram of gold after multiplying it with the calculated price of 18 carat gold as seen in the table above. Gold loan eligibility is measured in terms of loan per gram of gold or gold loan amount you may get given the value of gold pledged (dependent on price of gold), purity of gold and LTV applied by banks. The price of gold is taken as past 30 days average price of 22 carat gold and loan to value offered by your bank. Your loan amount elgibilty along with the interest rate offered and tenure of the gold loan determines your Gold Loan EMI. ILLUSTRATION 1: The borrower has 100 gm of gold jewelry. Multiple banks have provided different estimates of gold loan per gram and gold loan interest rate based on their assessment of gold weight, purity and loan to value ratio to be offered to the borrower. Bank X estimates the gold jewelry at 22 carat with a net weight of 75 gm (after deducting the weight of gems and stones). The bank applies a LTV ratio of 70% and offers the loan at an interest rate of 10.50%. At the lowest interest rate of 10.50%, the minimum EMI works out to be Rs. 2,560 per lakh loan amount for 4 years. Banks will take average price of gold of last 30 days to estimate the value of the gold to calculate a borrower‘s gold loan eligibility. The current average gold rate per 10 gram is Rs. 32,200. Borrower is eligible for a lower loan amount of Rs.2.07 Lakh from Bank X for 100 gram of jewelry at a lower interest rate compared to the other bank. Given, lower loan amount and lower interest rate, the borrower has to pay a monthly EMI of Rs. 8,546 from Bank X. In case of Bank Y, Mr. A is eligible for a higher loan amount of Rs. 2.21 Lakh for 100 gram of jewelry, but he will pay a higher interest rate and hence, a higher EMI on the loan. Whether Mr. A will take a loan from Bank X or Bank Y depends on the loan amount he is looking for. If the loan amount he is eligible to get from Bank X is suitable to meet his requirements, he may opt for lower interest and hence, low EMI loan. If he is looking for higher loan amount eligibility, it might be suit him to take a loan from Bank Y, even when it comes at higher interest rate. Gold Loan EMI is the amount that you pay every month to the bank or financial institution in order to repay your loan. EMI is composed of both principal amount and interest component. Interest component on your EMI is higher in early months and reduced with each EMI. EMI Calculator helps you to calculate your monthly EMI at desired interest rate for a particular tenure. ILLUSTRATION 2: Mr. B wants to take a Gold Loan of Rs. 3 lakh with a tenure of 12 months at an interest rate of 14.5%. He is not sure on how is repayment schedule look like in the case of EMI gold loan scheme and Bullet repayment gold loan scheme. Under the bullet repayment scheme, the borrower has opted for interest only EMIs where he pays monthly EMIs to service his interest expenses and pays the principal component in one go at the end of the loan tenure. Mr. B will end up paying more interest in the bullet repayment scheme, as he is not repaying any principal back to the bank during the loan tenure. Helps avail flexible repayment schedule where you can choose to pay interest on the loan as monthly EMIs and the principal payment in one installment at the end of the loan tenure. Some banks also offer the flexibility of paying some portion of principal as part of your monthly payments. You end up paying higher interest on your bullet repayment loan as it is not a reducing balance loan. Effective rate of interest is higher in a bullet repayment loan even when the quoted interest rate is same as that of EMI Gold Loan. EMI option saves you from the burden of repaying whole principal amount at the end of tenure. This repayment option is more suitable for long tenure loans. Though banks and NBFCs offer EMI repayment options on shorter tenure loans as well. 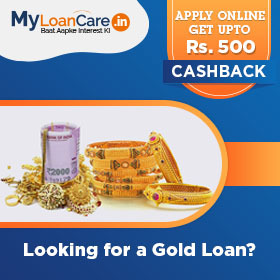 These loans can be availed at lower interest rates compared to bullet repayment gold loan. You carry a monthly burden of repaying your loan which can be difficult to service especially in short duration loans. When should you opt for a Gold Loan? You need the loan extremely urgently for a relatively short period of time. If you want to avoid extensive paper work or have no income proofs to avail a loan. This loan requires only basic KYC documents. 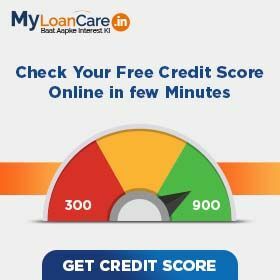 If you lack a credit history or have a bad CIBIL score. It does not undergo CIBIL checks. If you possess gold jewellery that you are willing to hypothecate. If you want to reduce you all-inclusive cost of borrowing. Gold Loans typically carry nil processing fees and pre-payment penalty, thus reducing the overall cost of loan. When and in what circumstances should I not choose a Gold Loan? If you are not comfortable with parting away with your gold jewellery and handover its custody to the bank. Your jewellery is typically kept safe by banks and specialised finance companies such as Muthoot or Manappuram, the only hitch is that you cannot use the jewellery, while it is with the bank. If you are looking for loans of more than 18 months. If you have alternative assets to pledge which may fetch you a lower rate of interest.